On March 5, 1945, Lena Baker was executed in Georgia, USA. 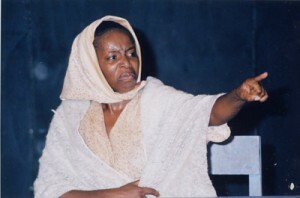 Now, 63 years later, Montego Bay, Jamaica-based actress Makeda Solomon has answered a calling that gave a voice to the silenced woman, through what promises to be a captivating one-woman play commemorating her life and tragic death. Who Will Sing For Lena? written by Atlanta based playwright Janice Liddell was performed, in an unprecedented simultaneous world premiere, by selected actresses in different parts of the world. Solomon’s selection marked a first for Jamaica in an international project of this kind, and was launched on March, 11, 2005. Solomon reprises her role as Lena on March 7, 8 and 9 at the Pantry Playhouse, New Kingston and then again at Fairfield Theatre in the tourist resort town on March 14 and 15.
Who Will Sing for Lena? tells the sometimes graphic story of the only woman ever to be executed by electric chair in Georgia, for killing a white man who had persistently abused and raped her. Baker maintained it was self-defense to the very end, but a miscarriage of justice saw her being put to death by a brutal system. Lena’s family and members of the Baptist church she attended, launched a battle with the Georgia Board of Pardons and Paroles to clear her name. Their triumph came in August 2005 when Lena was granted a posthumous pardon. There is no doubt that audiences will be moved by Liddell’s vivid account of Lena’s story and Solomon, a two-time winner of the Actor Boy Award for Best Actress in a Lead Role, with a 20 year theatre career, was Liddell’s clear choice for the Jamaican presentation. Liddell saw her versatility and range when she recently played African-American, Aisha in Liddell’s play Hairpeace. Liddell had flown to Jamaica to see her play performed by the Montego Bay Little Theatre Movement (MLTM) cast, directed by Fabian Thomas. When Solomon declared that she was seeking the challenge, a one-woman show as her next project, Liddell wasted no time in sending her the newly finished script for Who Will Sing for Lena? Theatregoers, particularly in the western region, will attest to Solomon’s ability to present authentic sounding world accents and dialects. A part in the award winning review Voices written by Thomas saw Solomon perform a piece in the voices of African, Indian, English, and Jamaican women plus, quite fitting for the Lena role, a young girl from America’s deep south. Audiences across the island can expect a powerful piece of theatre as Solomon has teamed up with accomplished actress, radio and TV presenter and veteran broadcaster Fae Ellington, who will make her debut in the director’s chair. Heavyweight Ellington, also an Actor Boy awardee, was the immediate choice for Solomon to have in her corner. Both women are fans of the others work and having worked together on Thomas’ 2003 Two For One production in Montego Bay, are excited to be together again. Women’s groups in Jamaica are already responding well to the project given its stark, truthful representations of a problem that sadly continues to plague many countries, including Jamaica. Who will sing for Lena? demands that society faces the consequences of the continued abuse of its women.